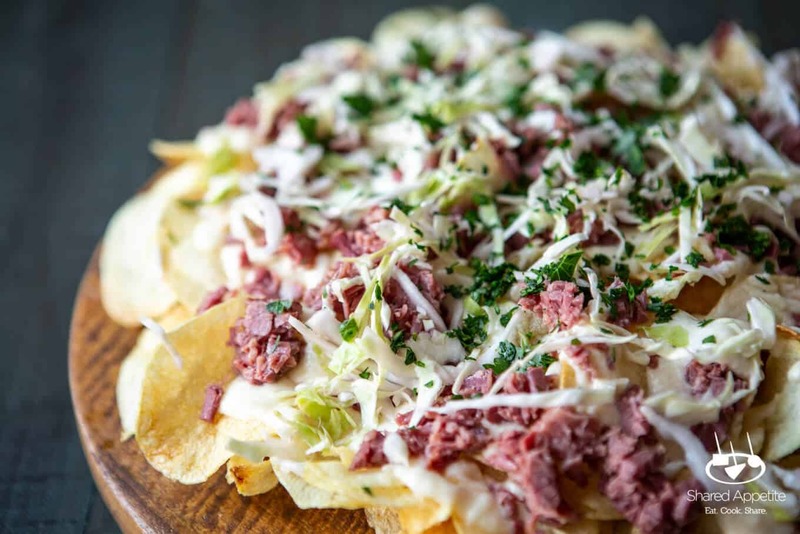 The perfect St. Patrick’s Day appetizer is here with these Irish Corned Beef Nachos with Swiss Cheese Queso and Pickled Cabbage! I can count on one hand the amount of times my family has celebrated St. Patrick’s Day since I was a little kid. It just wasn’t a big thing in our home, and even for the over-zealous celebratory adult I’ve become (i.e. I’m quick to celebrate pretty much everything and anything), St. Patrick’s Day still is very low on the holiday totem pole. Of course now that Olivia is at the age where she’s learning about each and every holiday (and makes countless art projects that she enthusiastically decorates our house with… definitely my kid), we’ve become more apt to celebrate anything she’s excited about. She’s all about St. Patrick’s Day, so this year we’re going to a parade, running walking a family-friendly St. Patty’s Day 5K, and going to her friend’s house (they are all Irish) for a little play date – holiday edition. Throughout the years I’ve tried cooking corned beef a few times, and each time I’m always highly underwhelmed. I didn’t get it. And cooked cabbage… still don’t get it. But then last night as I was trying to think about what Irish appetizer I could bring over to this St. Patrick’s Day celebration, I had an epiphany. 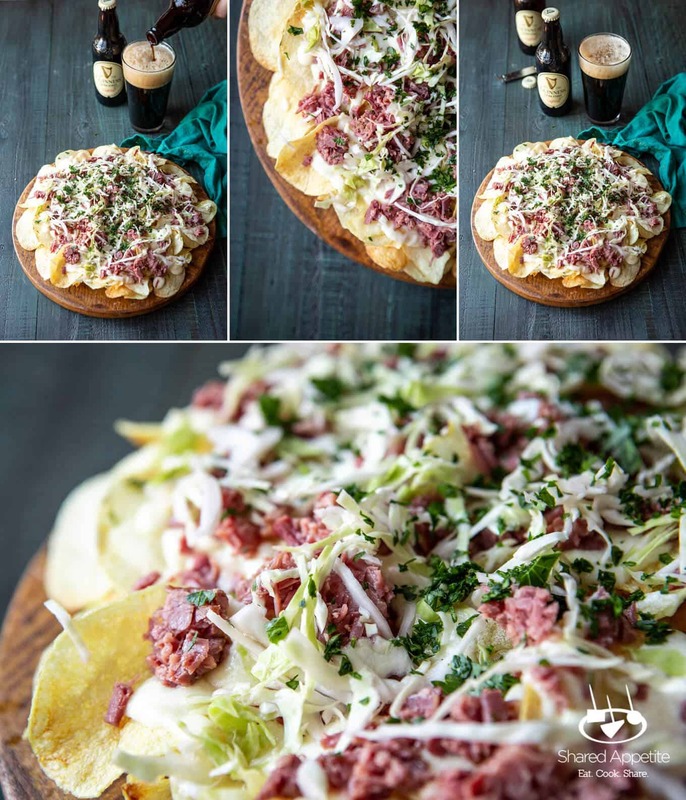 Let’s combine my love for Mexican food with the traditional flavors that we have come to associate with March 17th… and this St. Patrick’s Day appetizer for Irish Corned Beef Nachos with Swiss Cheese Queso and Pickled Cabbage was born. 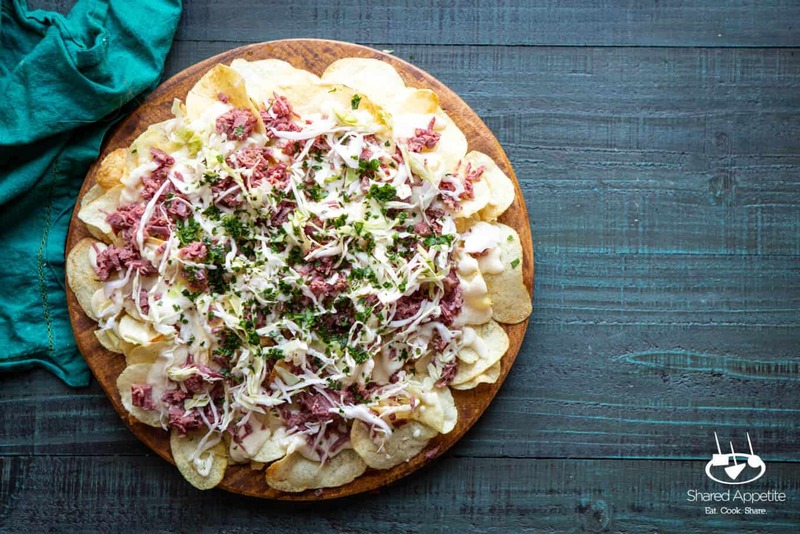 You can 100% use tortilla chips for these Corned Beef Nachos, but I decided to go with potato chips to help mimic the Irish Nacho feel. Some people argue that potato chips are more delicate and go soggy. 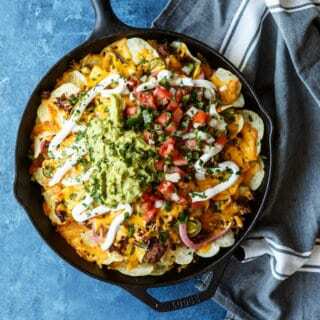 They definitely do have a soggy factor if you let these nachos sit for awhile, but let’s be honest. When’s the last time you were at a party and there was a nacho board that wasn’t devoured almost immediately? 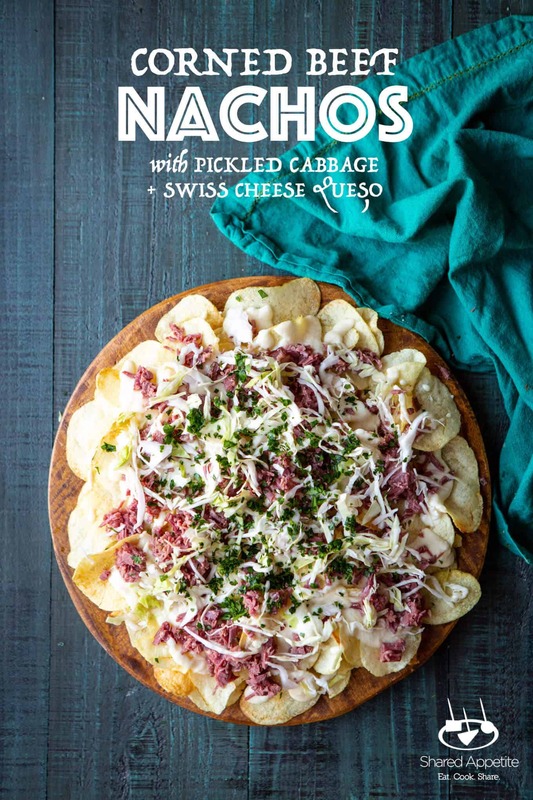 To be honest I’m not a huge Swiss cheese fan, but I knew that if it’s good enough for the reuben, it’s gotta be the right choice for these Corned Beef Nachos. Holy crap it was. Swiss Cheese Queso for the win. It paired so well with the flavors of the corned beef. You know what I’ve never seen a human being get excited for? Boiled cabbage. Gross. I knew that cabbage had to make an appearance on these St. Patrick’s Day nachos, and remembered how epic of a flavor punch pickled cabbage had on these Mini Mediterranean Veggie Sliders Mini Greek Vegetarian Sliders a couple years back! 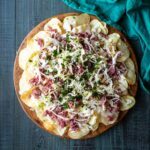 The pickled cabbage helps cut right through the richness of the corned beef and cheese, and it provides a great crunch and freshness to the nachos! Really, it’s up to you. Many people have their preferred tried and true recipe at this point. This year I decided to give my buddy Gerry’s recipe a try. He’s the super talented guy behind Foodness Gracious. I saw him post a recipe for Instant Pot Corned Beef the other day and knew I had to try it. The corned beef gets braised in Guinness and beef broth and is done in 90 minutes! I’ve never had corned beef as good as how his recipe came out. So good! Not going to lie. I wasn’t sure if these nachos were going to work. I mean, I knew that people who like corned beef and swiss cheese would like them, but I wanted to like them! I skeptically took a bite and my taste buds went into immediate party mode. 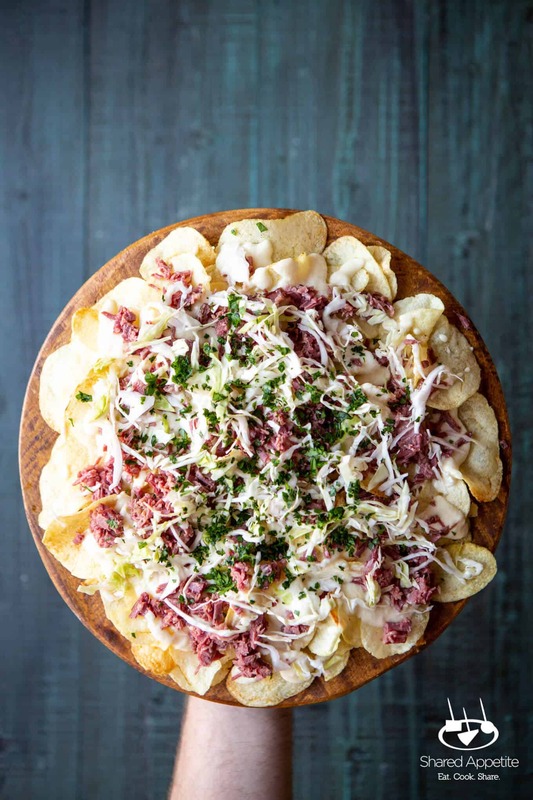 The combination of salty potato chips, smooth queso, rich corned beef, and pickled crunchy cabbage makes for the perfect flavor combination! I have a feeling we’ll be celebrating St. Patrick’s Day a whole lot more in our house moving forward. And these Irish Corned Beef Nachos with Swiss Cheese Queso and Pickled Cabbage will be front and center! Top potato/tortilla chips with Swiss cheese queso, chopped corned beef, pickled cabbage, and sprinkle with chopped parsley. Devour immediately! Melt butter over medium heat in a small saucepan. Add flour and stir constantly, until mixture is smooth. Cook, stirring constantly, for about 1 minute (avoid it getting brown). Add milk and stir until the butter mixture is fully incorporated into the milk. Cook, stirring occasionally to prevent the milk from scorching on the bottom, until it has slightly thickened and slightly reduced, about 6-10 minutes. The milk should leave a definite trail on the back of a spoon. Turn off heat and add Swiss cheese a few slices at a time, stirring to help it melt into the queso. Add red wine vinegar, hot water, sugar, and salt into a small bowl. Whisk until sugar and salt is dissolved. Add cabbage and stir, fully submerging cabbage into the pickling liquid. Let sit at room temperature for 1 hour, but preferably cover and store in fridge overnight (up to a week). Feel free to cook your corned beef by any preferred method. I used my friend Gerry’s (Foodness Gracious) Instapot Corned Beef recipe, which braises it in the instapot with beef broth and Guinness, and it was hands down the best corned beef recipe I’ve ever tried!